In the last few years, we’ve seen Mariano’s open in Bronzeville, Whole Foods in Englewood, and a proposed Shop & Save in South Shore. While grocery stores are a necessary access point for food in communities, they do not bring the kind of structural change needed to transform food environments. On the contrary, grocery stores only change the circumstances for those who choose to spend on healthier food—the filling kind, not limited to leafy greens—and the time to prepare it. In addition, it’s a conceptually backwards approach to the issue of food inaccessibility to reach out to corporations that created the issue in the first place. Profit-driven businesses have fled to suburbia over the past several decades because demand (and profit) was higher there than it was in inner cities. By turning to them, we are only giving them the power to abandon us once again whenever they choose—which, given the already-meager profit margins in the grocery industry, could happen at any time. To truly transform food environments, we must shift the conversation towards one of “food apartheid,” which more accurately captures how various structural inequities converge to produce existing food environments. Then, we can clear space for radical solutions that get to the crux of why many African-Americans in the city don’t have easy or equitable access to healthy, fresh, and affordable food. Allow me to backtrack for a second. My obsession with food environments began when I was a fifteen-year-old high school student I would spend an incredible amount of time staring out of windows: the window of the Metra and Blue Line as I traversed the city to Whitney Young for high school; the window of my mother’s backseat as I followed her on real estate showings that took us to the north, west, and south sides of the city; windows that passed teenage boys beating drums off the expressway and vendors selling chews and frooties off Stony Island. Each of these windows gave me a glimpse into the soul of the city, both North and South, windows that portrayed a narrative of the devastating inequality that is so starkly visible to black and brown people in Chicago. The more I became aware this geography, and of those who were most impacted by such blatant segregation, the angrier I became. This anger has become my impetus for seeking out solutions to the food crisis that’s occurring on the South and West Sides of Chicago. So how do we radically begin to talk about the toxic food environment that has been constructed intentionally in African-American communities in Chicago? In my thesis, I go further, connecting “food apartheid” conditions not only to segregation but also to the roots of capitalism and racism that run deep within American society. My approach necessitates that the current and inequitable food system be understood through the exploitation of the black worker. The stolen and lost wages from such exploitation historically have left African-Americans as some of the lowest paid workers in the country. Food access and security is linked directly to income and wealth. 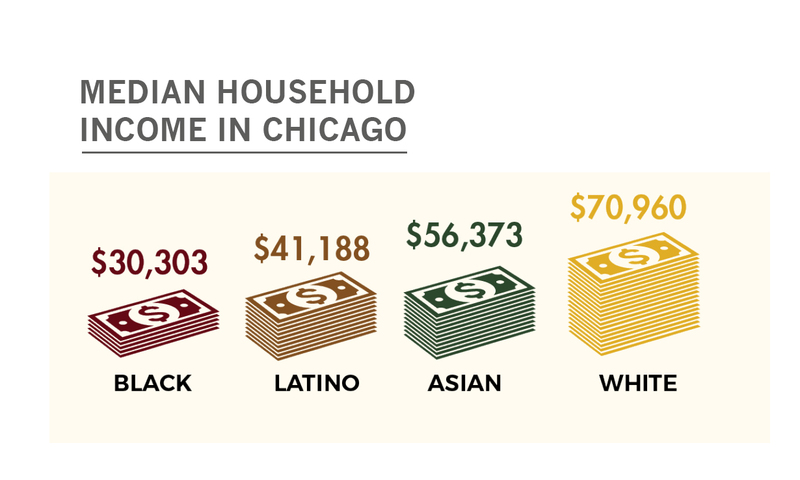 Median household income for Black families in Chicago is $30,303; the median household income for whites is $70,960. An all-too-frequently heard counter-argument is based on supply and demand theory: that in African-American communities there is a high demand for fast food and thus, there exists a high density of fast food chains. But we must look beyond that insufficient argument to question why a demand exists for cheap food. If a family is to choose between fresh healthy food, which includes preparation and takes even more time, and cheap fast food, their income will most often force them to choose the latter. Federal housing policy during the 1930s and 1940s, influenced profoundly by anti-black racism, has also played a significant role in shaping food environments. Redlining is a process by which the Home Owners’ Loan Corporation (and other housing agencies) colored white communities green and approved mortgages in that area, while Black communities were marked red and denied access to loans. Restrictive covenants, private contracts in which homeowners could exclude African-American and other ethnic minorities, were other tools used to keep blacks out of white communities and accelerate segregation in American cities. Strategic planning around public housing was further used to maintain separation between whites and blacks. One way of working to lift residents out of poverty is to address the deplorable segregation in the city. As “The Cost of Segregation,” a report published last year by the Metropolitan Planning Council and Urban Institute, found, if we reduced rates of segregation to those seen in Atlanta (the median city for segregation in America), incomes for Black Chicagoans would rise an average of $2,892 per person per year. In addition to this, the region as a whole could earn an additional $4.4 billion income and decrease Chicago’s homicide rate by 30 percent. Pushing for these structural changes works to benefit all in the city who are struggling to make ends meet. We must also work to increase the minimum wage to at least $15; poverty is directly linked with rates of food insecurity. In Englewood, the median household income is $18,900. Data published by the city’s Healthy Chicago portal shows that unemployment stands at 34.8 percent, household poverty at 34.4 percent, food access (areas with low food accessibility) at 29.8 percent and those depending on food stamps/SNAP at 42.7 percent. Compare that with Lincoln Park, which has a median household income of $88,700. Unemployment in Lincoln Park stands at 4.2 percent, household poverty at 11.2 percent, food access at 0.6 percent, and those utilizing food stamps/SNAP at 3.9 percent. The disparities are jarring. If we can collectively push for higher wages and fight segregation, the impact on African-Americans’ income would increase their purchasing power, and by extension, their ability to purchase quality food and produce. On a grassroots level, we ought to be taking a community-based approach to food systems. We should be empowering communities by giving them access and ownership to land. As Malcolm X recited in Message to the Grassroots, “Revolution is based on land. Land is the basis of all independence. Land is the basis of freedom, justice, and equality…” This land can be utilized to build urban farms that involve the community in the growing process and create grocery cooperatives that employ residents and resist the capitalist, profit-driven motives of corporations. I had the opportunity to work with Sweet Water Foundation this summer, an organization that is doing just that. There are other organizations in the city that are doing great work around food access and equity, including the Urban Growers Collective, Little Village Environmental Justice Organization (LVEJO), and Grow Greater Englewood. The food environment in African-American communities in Chicago is a byproduct of how Black people have continued to be treated as second-class citizens in this country. The disparities in health, education, wealth, and employment in Chicago all point to this mistreatment. Can you begin to see how opening a grocery store does very little to alter the status quo? Grocery stores are necessary amenities, and I commend the organizers working within Chicago to bring food to their communities. But the problems run deeper, and we will not solve the food accessibility issue with just placing grocery stores throughout the city. The work needed, say, of fighting against the severe segregation and pushing for a higher minimum wage is an uphill battle; but it’s also one that will work to not only transform food environments in Chicago, but also the quality of life for many living on the South Side. 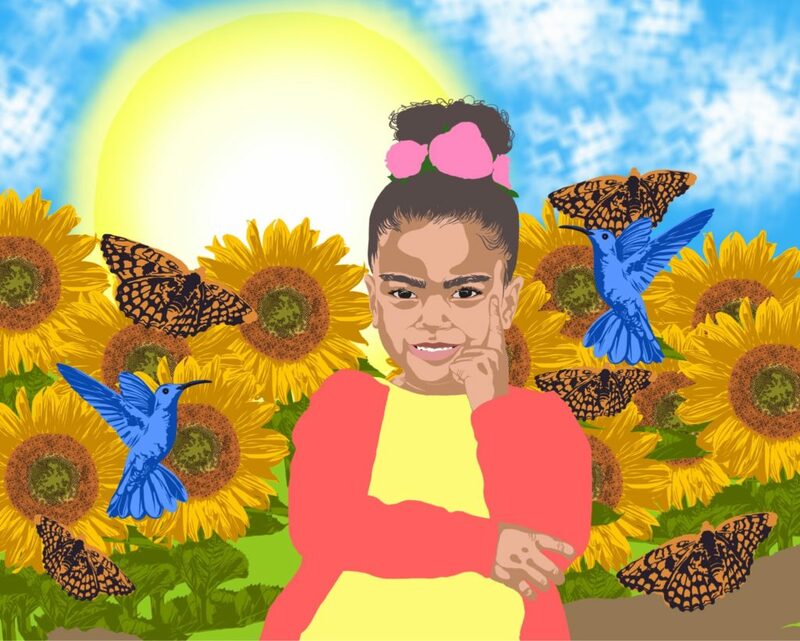 Dejah Powell is a graduating senior from Chicago majoring in Environmental and Sustainability Science and minoring in Business and Community Food Systems at Cornell University. Visit her blog, 20somethingandgrowing.com to hear more of her ideas on food and food justice. This is her first piece for the Weekly. Great article! The City of Chicago has done some work in the Englewood Community to build Walmart and Whole Foods ,but the key ingredient is lack of resources. How can we attract investors to spend money? There are so many vacant lots in these communites where urban gardens can be built for the people. This would be a great campaign for you to kick off! Great job…so glad that someone has noticed and wrote such a great paper on our people our community that needs desperate help if we are to survive….another form of slavery. What an incredible read, food apartheid really describes how many in Chicago, myself included are living. Thank you for sharing and raising real food for thought. Keep us informed about next steps. Dejah! First, Congratulations on your radical work for your senior thesis, graduation. Your article has rounded out a poignant week for me of exploring the impacts of racial housing segregation and the impract that has had on our communities on so many levels. I will be certain to start using the term Food Apartheid at work to make sure I help others understand that this void is by design and is a direct result of residential segregation and intersection of race and class in the United States. Thank you for sharing your voice and this critical topic with the world. Awesome Deja, God Bless you! Nice piece Dejah. I hope this is the prelude to working deeply on issues regarding food and other areas of life. It is a pleasure to watch your evolution and I look forward to seeing what the next chapters bring. The free market responds to demand. The demand is just not there to make full service grocery stores profitable on the south and west sides. Remember that businesses operate for profit, not strictly social conscience. Add the fact that any business operating in these neighnorhoods needs to spend an extraordinary amount of money on security and shrinkage due to shoplifting. In addition there may well be a very limited labor pool in these areas. It’s not like various supermarket chains haven’t tried. They open stores that just aren’t profitable, so they end up closing. That’s how the free market works.